Once in a while, crowdfunding site Kickstarter does have some pretty cool looking projects, where they have ranged from the usual iPhone 4/4S case all the way to a new remake of a classic game (Leisure Suit Larry). Well, what do we have here today? Dragon Grip Interactive, the folks behind real life gaming experiences, has unveiled the Dragon Grip. Just what the heck is the Dragon Grip, does it allow you to literally hold a mythical dragon in the palm of your hands? Apparently not, but there is still something very oriental about the Dragon Grip, considering this is a patented hand held toy which is capable of churning out kung fu fighting sound effects. Yes sir, no longer do you need to rely on your imagination when you have a couple of action figures in your hands as you regale tales of old to your son before he heads off to dreamland – just use the Dragon Grip for the added dash of sound effects, and I am confident that many years from now, your son who is all grown up, will still be able to remember the kind of realism his bedtime stories sound like thanks to the Dragon Grip. The Dragon Grip is now available for pre-sale on Kickstarter.com, and this particular project closes on June 24th next month. To have a better idea on what the Dragon Grip is an all action handheld toy which emits fight sounds, verbal taunts as well as general sound effects which will immerse the player in a video game like experience anytime, anywhere. You will need to do your bit in choreographing those sound effects, using your very own fighting moves and style so that a surreal kung fu experience of your own can be created. The Dragon Grip was inspired by “Legend City” comic books as well as influenced by classic 1970’s kung fu martial art films, resulting in a toy which is cool to look at as well as fun to play. 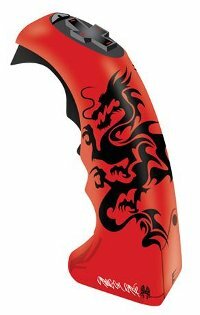 The first edition (black with red) and a special Kickstarter Reverse Color Way (red with black) Special Edition will include unique martial arts inspired dragon logos etched onto the device’s handle.